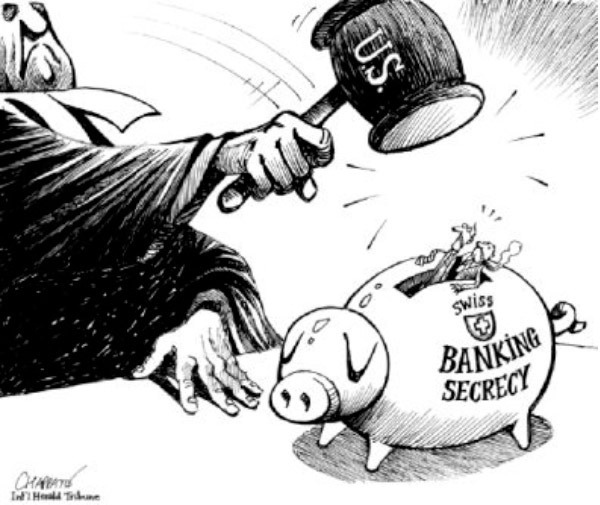 Credit Suisse pleads guilty to a fine of USD 2.8 Bio. Are you looking for the most cost effective life insurance for your family? Comment: Although the five-month platinum strike ended a few weeks ago, it is extremely concerning that we go from one crippling strike into the other, with the South African economy suffering as a result of the political games being played by the unions. It is unbelievable that 250 000 metal workers can potentially be responsible for our country dropping to junk status on the bond markets, as the international rating agencies have downgraded the outlook for the South African rating from A- to BBB. The results of which will be catastrophic, to say the least, for the very people who have been striking over the past six months. Those strikers have lost approx. R 10 Bio. in wages which is lost to the economy. Inflation, which has already exceeded the Reserve Bank’s ceiling and rising interest rates will, in a matter of months, wipe out any gains they may have made. Let’s hope sense prevails. On 6 May 2014 the Declaration on Automatic Exchange of Information in Tax Matters was endorsed during the OECD’s annual Ministerial Council Meeting in Paris by all 34 member countries, along with Argentina, Brazil, China, Colombia, Costa Rica, India, Indonesia, Latvia, Lithuania, Malaysia, Saudi Arabia, Singapore and South Africa. The Declaration commits countries to implement a new single global standard on automatic exchange of information. The standard, which was developed at the OECD and endorsed by G20 finance ministers on 2 May 2014, obliges countries and jurisdictions to obtain all financial information from their financial institutions and exchange that information automatically with other jurisdictions on an annual basis. Switzerland, Singapore, Luxembourg and two other major financial centres will participate in the exchange of information system. The adoption represents a political statement of intent. The formal introduction of global standards is yet to be established and the adoption of the new rules has to pass Swiss governmental procedures for the change of laws. The actual exchange of information between countries is likely to start in 2017 at the earliest. The US enacted the “Foreign Account Tax Compliance Act” in 2010 to curtail offshore tax evasion of US citizens abroad by obtaining information from foreign financial institutions (FFIs) abroad. Under the agreement, they have to provide the IRS with information on US account holders on an annual basis. The controversial Act has been introduced around the world, marking a “new era for tax planning”. In the event that an FFI fails to comply, a 30% tax will be imposed by US authorities on withholdable payments made to FFIs. South African Finance Minister Nhlanhla Nene signed the agreement with the US at the beginning of June this year. The bank has admitted to “conspiracy to assist US customers in representing false income tax returns” and has paid the above settlement to the US Government. This was the outcome of a 4-year investigation into advice given to some of Credit Suisse’s clients. The matter represented the most significant and long-standing litigation issue for the bank and resulted in a second quarter loss of CHF 749.0 Mio. It was rather surprising to see that the two countries signed the „Tax Information Exchange Agreement (TIEA) “. The agreement, which has been backdated to the beginning of the year, enables both countries to the exchange of information should one of the states require further information on tax payers – the banking secrecy in Liechtenstein is therefore no longer valid. Should you wish that our office attends to your tax returns, please make sure you send us all relevant details by no later than the end of September 2014, so that we can submit in time on your behalf. Not everyone needs to file an income tax return (ITR12). Once again the annual income threshold for submitting a tax return is R 250’000. The insurer is now working with preferred suppliers in respect of their claims procedure. We welcome this change, as reduced preferential rates will positively impact the cost of claims. Regrettably, in terms of their governance process, BNB Sure will no longer pay service providers who have not been identified as preferred suppliers. We urge you to contact SwissFin at claims stage first, before appointing any suppliers on your own (this includes motor glass claims). In case of an emergency, BNB Sure’s 24-hour Hotline may be used: 0800 556677. According to information released by the motor insurance company Execuline, thefts of Toyota Fortuner and Hilux are on the increase, but the new Range Rover Evoque has now joined the list. For the Fortuner and the Hilux, Kwazulu-Natal is the worst affected province in South Africa. The modus operandi of hijackings of the Range Rover indicates that a syndicate is involved and owners are urged to be extra vigilant. In a landmark ruling early this year in the Naphuno Regional Court in the Limpopo Province, the managing director of a mine was convicted of statutory offences involving water and environmental damages. This is the first conviction of a director of a mining operation being personally liable for damages. He was given a five year suspended sentence under the condition that the affected area is rehabilitated. The ruling highlights the necessity for directors and owners of companies to insure themselves against such rulings. Several insurance companies provide “Director and Officers Liability Insurance” and we urge all Directors/Officers that could personally be exposed to such claims, to have the appropriate insurance cover in place. According to the South African Police Service crime statistics, an average of 160 vehicles are stolen every day and 358 broken into. Park smartly: Avoid dark or isolated parking areas. Make sure the area is guarded. Keep valuables safe: Ensure that all valuables including GPS are safe. Do not leave such items in the centre console or glove compartment. Do not keep car registration documents in the car. Make sure your car is really locked before walking away – jamming devices are on the increase. Do not leave any items in your car that are visible from the outside. Do not move items in the boot whilst leaving your car – there are always third parties observing you. We see too often that families with dependants insure the husband and the wife on individual life insurance policies. The purpose of these policies is to have sufficient funds for estate duty etc., should both spouses pass on. However, there is a far cheaper way in obtaining the same result, by taking out a “last survivor death benefit policy” for both spouses on one policy only! It pays out once the second life insured passes away. Requested life cover benefit: R 2.0 Mio. Average premium quoted by all insurance companies: R 1000-00 p.m. Premium for last survivor death benefit policy: R 150-00 p.m. Monthly savings: R 850-00 p.m.!! Our clients even qualified for almost R 2.2 Mio life cover, as R 150-00 was the minimum premium. They could have actually increased the life insurance cover several fold and would still have saved a huge amount of money every month. should you wish to review your existing life insurance policies. From 1 May 2014, the insurer introduced a “pay as you go” gym benefit from which clients can enjoy up to a 100% discount on their gym fees. Members sign a debit order with Virgin Active and they deduct the full gym membership fee on the first day of each month. When signing up, members pay an activation fee of just R99, a Virgin Active card fee of R120 and a pro-rata gym membership fee depending on the day of month when they sign up. In the first month Liberty rewards members with a possible R 300 cash paid into their account regardless of whether they have started going to the gym or not. Thereafter, Liberty will refund members based on how many times they went to the gym in their first month. Contrary to some media reports, it is still possible to extend the visitors’ visa once. The rules on this have not changed. Visa exempt persons are still issued visitors’ visas for 30 or 90 days (depending on their exemption) on arrival, and they are allowed to apply for a once-off extension of such visa by another 90 days from inside the Republic. There is no need for a police clearance, medical reports etc. Persons entering South Africa for short-term work (film crews, teachers, artists, musicians etc.) 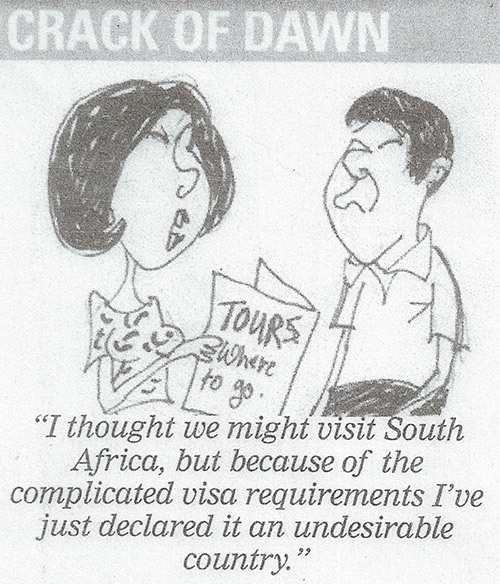 can apply for an “authorization to work” attached to their visitors’ visa. Even those who are visa exempt are now required to appear personally at a South African mission in their country of residence to apply for such a short-term visa. The minimum amount to qualify for a business permit is R 5.0 Mio. The net worth of an independent investor is now R 12 Mio., instead of R 7.0 Mio. The fee payable has increased to R 120’000 compared to the previous one of R 75’000. South African relatives now have to show funds of R 8’500 instead of R 5’000 per month being available to support their foreign family members, including their spouses. The Department has extended the “grace period” for travellers younger than 18 years to obtain their unabridged birth certificates to 1 October 2014. As of today, there are still some visa types which cannot be applied for, as the online IT booking system does not allow these. Neither Home Affairs nor VFS can provide any information on when these applications for spousal visas will be available on the system. The stickers in the passport for permanent residence holders have been abolished – now you need to travel with the PR certificate and your passport. Import of second hand motor vehicles for the purpose of exporting to other markets outside the Republic of South Africa, the exotic entertainment industry and the security Industry. The list of undesirable business undertaking in relation to an application for corporate visa are exotic entertainment, hospitality industry, fast-food outlets/franchises and cosmetic and beauty industry. The travelling to the relevant missions in their home countries are often a day’s trip away from their home. In China there are only two application centres in Beijing and Shanghai and some applicants have to travel 3500 km to apply for a visa! Reports already indicate that Chinese operators have stopped promoting South Africa and are sending their clients elsewhere in Africa. Heavy-handed implementation of the new Immigration Regulations has resulted in the unconstitutional treatment of family members of South African citizens and permanent residence holders, declaring them “undesirable”. The High Courts in the Western Cape have ruled against Home Affairs in at least four cases and the Department was instructed to review the procedures. There are 900 (!) cases still waiting to be heard. Amongst other, our association of immigration practitioners (FIPSA) is taking the Department to Court too. In- and outbound travel in South Africa was worth R 24 Bio. last year. A quarter of this came from people travelling with children. Making it more difficult for these travellers will cost the country dearly as the regulations far exceed global standards. No one denies that child trafficking needs to be stopped, but making it near impossible to travel here with children cannot be the solution. Even though overstaying might no longer result in a person being declared “undesirable”, we still recommend that persons with pending applications do remain in South Africa if possible. Unfortunately we continuously see officials at the port not being properly informed or misinterpreting the Regulations. We will keep you informed on further developments. The 5 countries, Brazil, Russia, India, China and South Africa formally launched a development bank that would have USD 100 Bio. in capital and its headquarters in Shanghai. This decision was taken mid July during a summit of the 5 countries in Brazil. India would hold the first presidency for 5 years. The BRICS bank is seen as a strong push against the World Bank and the International Monetary Fund, which are both very US- and European-centric. The aim of the bank is to push regional trade, investment, infrastructure development, job creation and reduction of unemployment amongst the member countries. The proposed Liquor Act prohibited anyone from possessing more than 150 litres or 200 bottles of wine without a liquor licence. The bill now proposes to repeal this section and any person storing such amount of liquor, has to present upon criminal proceedings, that such amount is reasonable to him and his family or is a bona fide collector. Another welcomed change is the granting of temporary liquor licences to all people hosting events, such as schools etc. A rather strange proposal, namely that bottle store owners may soon be required to provide free water and condoms to their patrons, has not been welcomed by many industry players. The public is advised to submit their comments before the debate continues in Parliament. 1. Hitler led the first public anti-smoking campaign in modern history. 2. The first European who learned to smoke from the natives, was arrested back home because people thought he was possessed by the devil. 3. Smoking near Apple computers voids the warranty. 4. Rapper Tupac’s ashes were mixed with weed and smoked by the members of his hip hop band. 5. 15 billion cigarettes are smoked worldwide every day. 6. Tobacco addicts are most likely to consider quitting the habit on Mondays. 7. Cigarettes are the single-most traded item on the planet, with approximately 1 Trillion being sold from country to country each year. At a global take of more than $400 billion, it’s one of the world’s largest industries. 8. Nicotine reaches the brain within 10 seconds after smoke is inhaled. It has been found in every part of the body. 9. Every cigarette you smoke reduces your expected life span by 11 minutes. 10. Smoking increases the risk of diabetes and dementia. 11. Nicotine is more addictive than heroin and alcohol and is delivered to the nervous system within seven seconds for a quick fix. 12. Overall risk of mortality returns to normal after 10-15 years of non-smoking. We would like to welcome Mrs Renate Schmocker to our team. She is a Swiss citizen and has been in South Africa for a few years. Ms. Amanda Rasch is on maternity leave since 1 August 2014 and will be back on 1 December 2014. We wish Mom and Dad all the best and lots of joy with the new arrival to the family. Ms. Natasha Greenfield is leaving us at the end of the August in order to spend more time with her family. Ms. Wanda Scott will be joining us shortly to replace Ms. Greenfield.